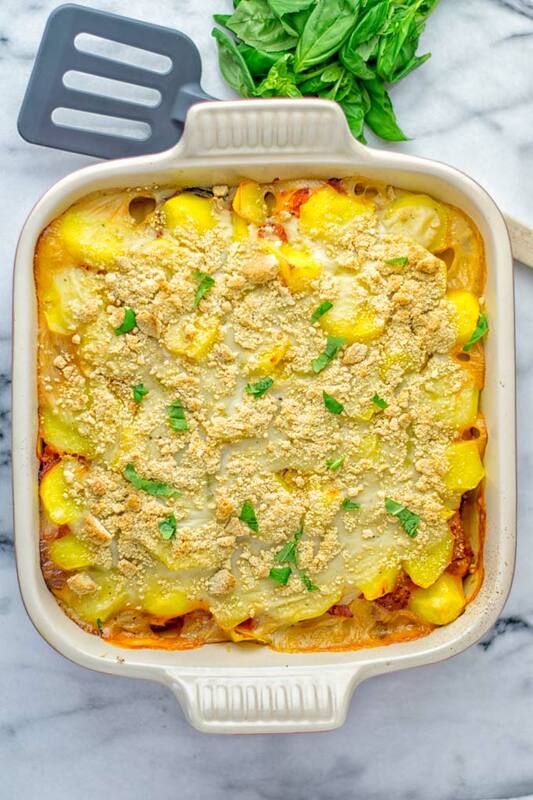 This Eggplant Parmesan Potato casserole is entirely vegan, gluten free and so easy to make. Filling, mouthwatering, satisfying and a winning combo for everyone who loves comfort food. 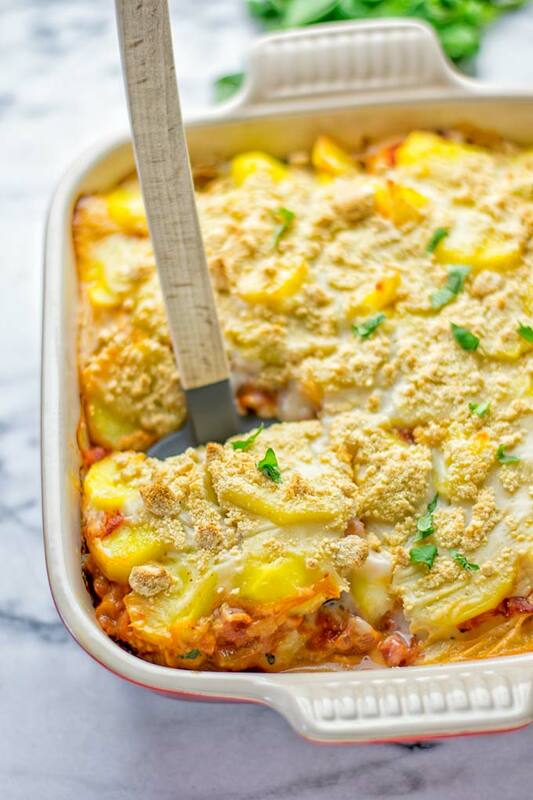 Seriously, I have a big soft spot for casseroles. I make them all the time. Just think about how good this Moroccan Chickpea Lentil Potato Casserole is, or the Mexican Street Corn Potato Casserole. Who does not love to fill big plates with these? Right, but that’s not all I have for casserole lovers. Feel free to browse around. Explore the search bar, type in “casserole”, and let the fun begin. 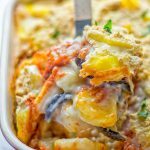 This Eggplant Parmesan Potato Casserole is a winning combo for everyone who adores good and delicious food. Are you in? I bet, yes! It’s hearty, filling, comforting, creamy, flavorful, super easy, satisfying, mouthwatering. You will know from the first bite, friends, there isn’t any regret! Also it’s cheesy, addictive, great to impress your sweetheart on a date, and a meal that the whole family will love. Eggplant Parmesan is traditionally not plant based or gluten free. It’s often made with white sauce made from milk or heavy cream. Also you can find Parmesan (obviously), mozzarella, and eggs to add flavor and get that cheesy texture. Often it’s topped with bread crumbs. Eggplants are also often fried to make them crispy and texture perfect for all the other components. I do something different. Obviously to keep it vegan and gluten free so everyone can enjoy this, no matter what diet directions you follow. For the cheesy flavor: we make a white sauce with plant based milk. My favorite is almond milk but any other all work. We add nutritional yeast to it, also we top everything with a vegan Parmesan. 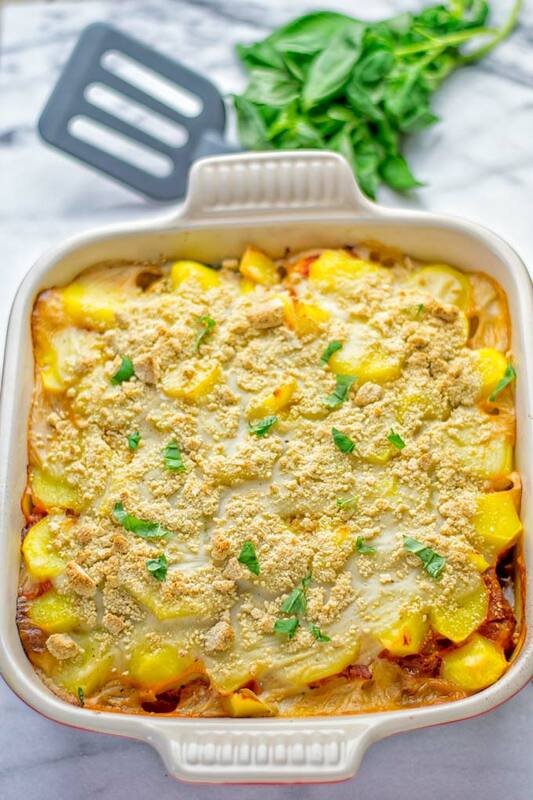 I made the white sauce based on the one on my Best Vegan Moussaka for this Eggplant Parmesan Potato Casserole. It’s made with olive oil and light buckwheat or gluten free all purpose flour. Heat oil, add flour whisk until combine add plant based, whisk again until thick and bubble. Be careful not to burn the sauce. Add nutritional yeast, season with salt, pepper, and nutmeg. 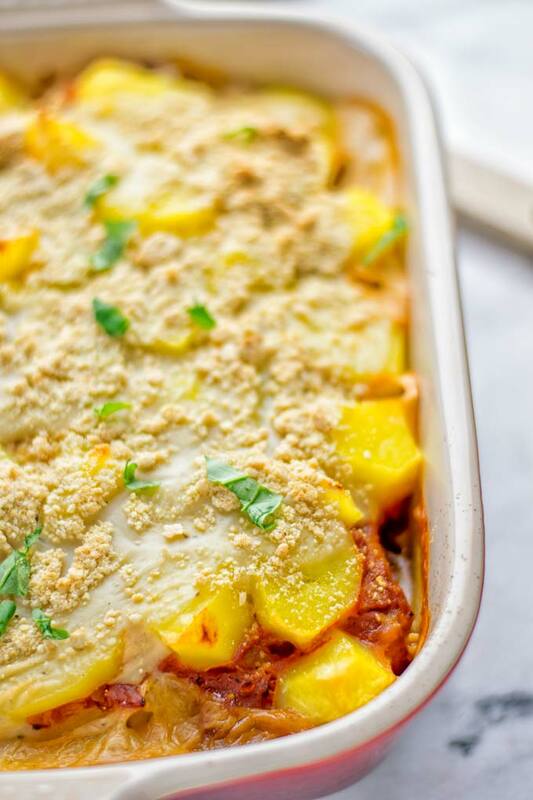 Whenever you make this Eggplant Parmesan Parmesan Zucchini Casserole, please make sure to prepare your eggplants before. You have several options to do this. The simplest way is to buy pre-cooked eggplants, that you can find in almost every supermarket. Also starting from fresh eggplants, you can fry them before. For this you have 2 options: Heat olive oil in a skillet and simple fry eggplant slices until done. But if you don’t want to use oil, place eggplants in a tiny amount of vegetable broth and fry with this. For baking instead, spread eggplants on a baking sheet prepared with parchment paper. Season with salt and paper and sprinkle some oil or vegetable broth on top. Bake for around 10 minutes at 425°F. Last but not least: Simply steam eggplants using your microwave or casserole steamer attachment. Check the instructions properly. 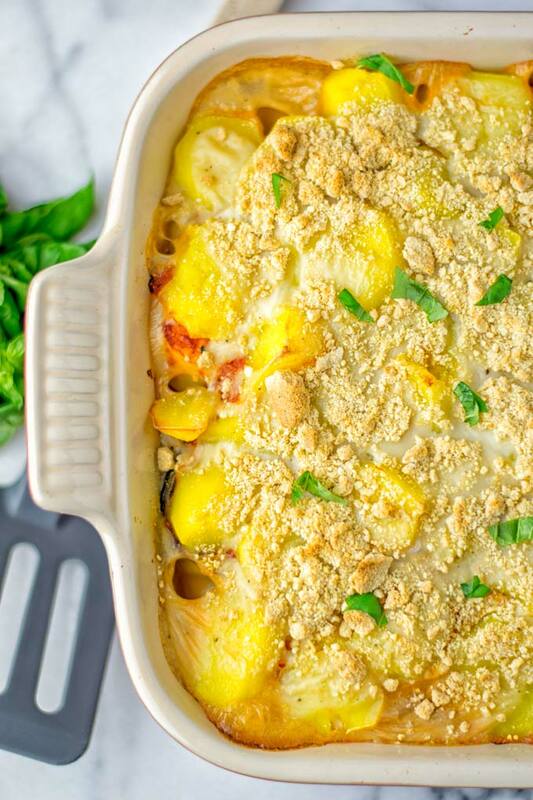 Note: If you want go straight to making this casserole without preparing the eggplant before, this will add more baking time to the final dish. For all the methods above you can leave on the skin or peel the eggplants. It’s all based on your preferences and taste. Start by washing your eggplants. This is a step you should always do when preparing them. Then use a paper towel and dry. Also, always: cut off the ends. Peel off stripes from the eggplant. Before we’re going to start: you will need a 10×10 inch casserole dish for this! Have the eggplants and white sauce prepared, potatoes pre-cooked. First, make the tomato base. Simply combine chopped tomatoes with garlic. Note: If you wish to use the optional onions, heat a small skillet with a bit olive oil or vegetable broth. Fry them for around 3 minutes until softened, then add to the tomato base. Next and last is assembling: start with the tomato base on the bottom of your baking dish. Proceed with a layer of eggplant slices, season with salt and pepper. Add a layer white sauce, followed by potato slices, again add a pinch of salt and pepper. Repeat this until everything is gone. The last layer should be white sauce. 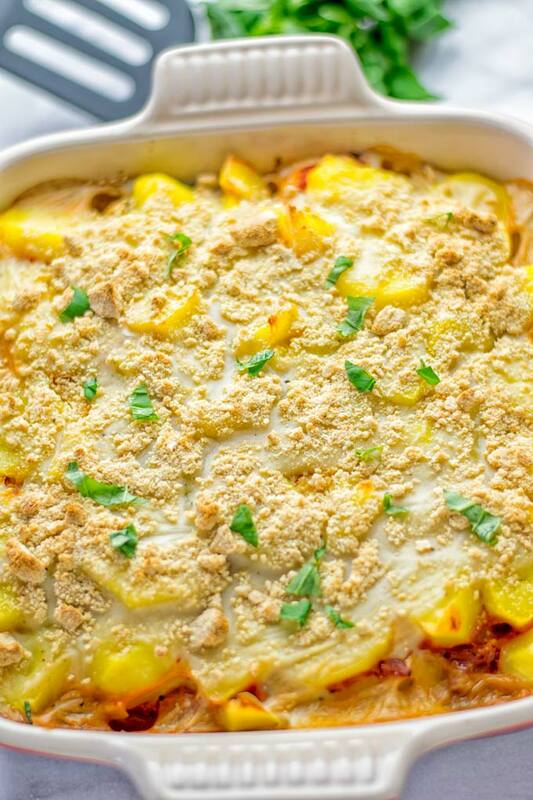 Sprinkle with a generous amount of prepared vegan Parmesan and bake for around 25 minutes at 425°F. 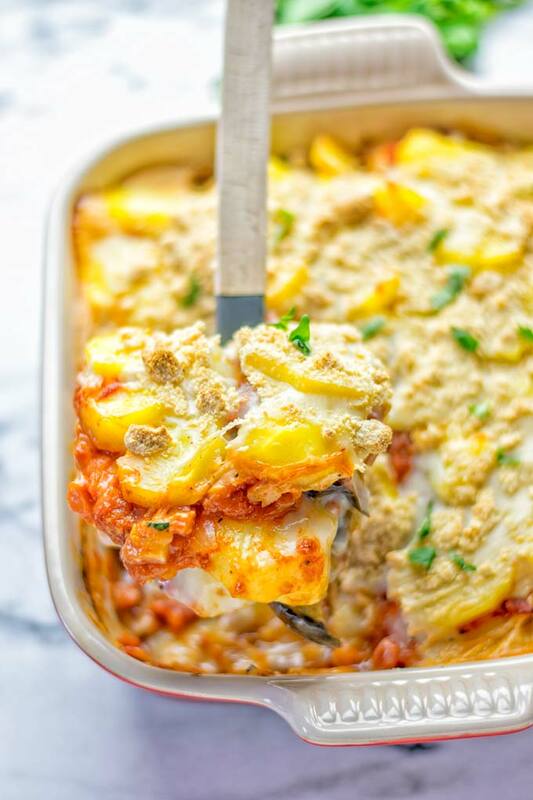 This Eggplant Parmesan Potato Casserole makes a rich and indulgent dinner, lunch, family meal, and meal prep to eat through the week. Also it’s great for work lunch and of course date night. Serve this to your family, sweetheart, loved ones or just yourself. You deserve the best. This is a keeper, will bring everyone’s face to wow. 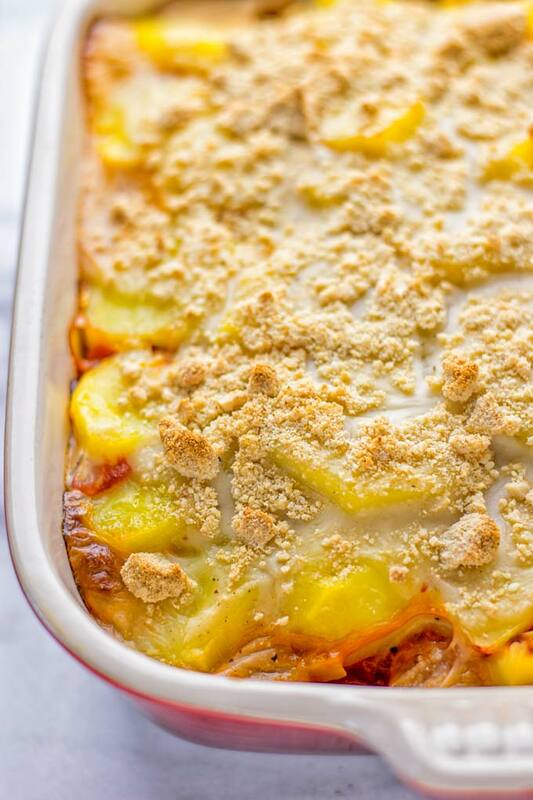 If you give my Eggplant Parmesan Potato Casserole a try, tag me on Instagram and Facebook. Snap a picture and share your feedback. I’m happy to see all your creations as always. 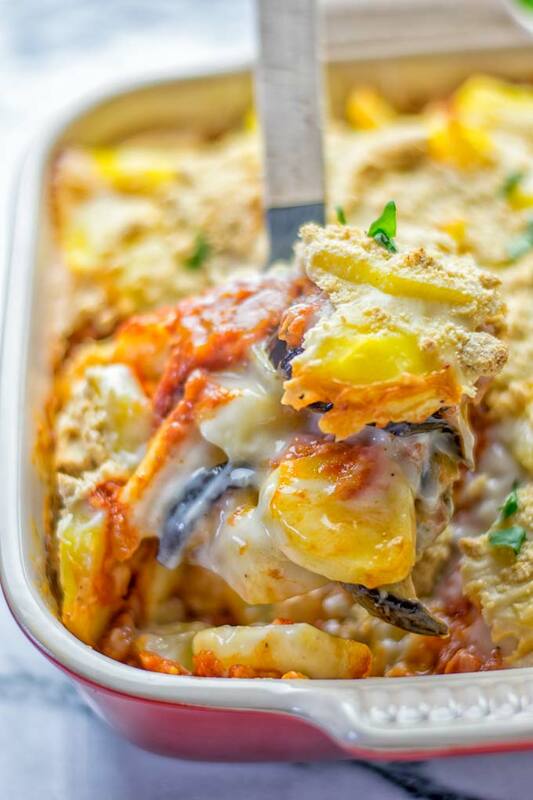 This Eggplant Parmesan Potato casserole is entirely vegan, gluten free and so easy to make. Filling, mouth watering, satisfying and a winning combo for everyone who loves comfort food. You will need a 10×10 inch casserole dish for this! Have the eggplants and white sauce prepared, potatoes pre-cooked. Make the tomato base. Simply combine chopped tomatoes with garlic. Note: If you wish to use the optional onions, heat a small skillet with a bit olive oil or vegetable broth. Fry them for around 3 minutes until softened, then add to the tomato base. Next is assembling: start with the tomato base on the bottom of your baking dish. Proceed with a layer of eggplant slices, season with salt and pepper. Add a layer white sauce, followed by potato slices, again add a pinch of salt and pepper. Repeat this until everything is gone. The last layer should be white sauce. Sprinkle with a generous amount of prepared vegan Parmesan and bake for around 25 minutes at 425°F.